Writing a thank you for funeral flowers is possibly the last thing on your mind when you have just been through the trauma of burying or cremating a loved one. But, after a reasonable period of mourning, etiquette requires thank you notes to be sent to all of the people who have been thoughlful and sent funeral flowers or sent a floral tribute to your home. This can be intimidating, especially if you're not used to writing. I hope the sound advice here will help you to write meaningful notes so you can express your gratitude at this most difficult time. You'll probably be much too weighed down with grief to make a note of all the flowers you receive, so it's a good idea to get someone else to do this for you. If you don't feel ready to deal with the task of writing thank you notes personally, why not consider asking a friend or relative to write them for you? People will know that you are grieving and will be satisfied with a brief, heartfelt letter from you to say thank you for funeral flowers. Don't worry about writing the 'perfect' thank you note. People won't expect you to write anything more than a few lines of gratitude. You'll find some sample thank you notes here. Keep it simple ... just a few lines is fine. 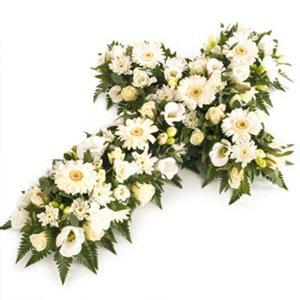 Keep it timely ... aim to send your note within two to three weeks of receiving the funeral flowers. The flowers you sent were beautiful and meant a lot to me. I have them on my mantle and whenever I view them, I think of our friendship. I miss Bill immensely and am glad I can count on you to help me through this difficult time. Thank you for your kindness in sending flowers to the church for my father's funeral. The wreath was beautiful and it held many of the flowers that Dad had tended so lovingly in his own garden. What Type of Thank You Card to Send? A good funeral director will provide you with formal thank you cards. You can choose whether to send these very formal cards or choose something more suited to your taste and to the deceased.